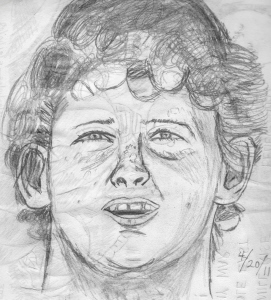 my admiration of Terry Fox, the day after he died. The scenario I think is that God became pleased so much with Terry's courage that He decided to take him out of this awful world as soon as possible. At least, that's how I rationalize it. One thing is for sure: Terry did not know he was dying when he started his marathon of hope. I should finish the drawing in time for his twentythird birthday on Tuesday. In one picture, it looks as though he had been in pain. Note: At that time, I was at the peak of my adult life. I loved my work and my life. I feel guilty that I was enjoying life so much while the hurting continued for Terry Fox, his family and friends, and Canada. Sunday, 19 September 2010, the 30th Terry Fox Marathon! 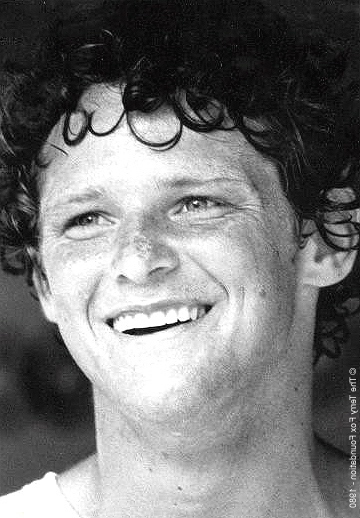 Terry Fox up close: his freckles, his gelasins, and his curls. 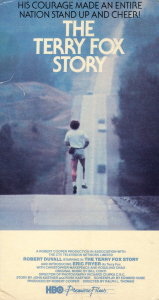 (C) The Terry Fox Foundation, 1980 -- which I flipped back laterally. Terry had the wen under his left cheek. Click on the picture of Terry's running to go to the Terry Fox Organization. This kindergraph appears to be around 1969. 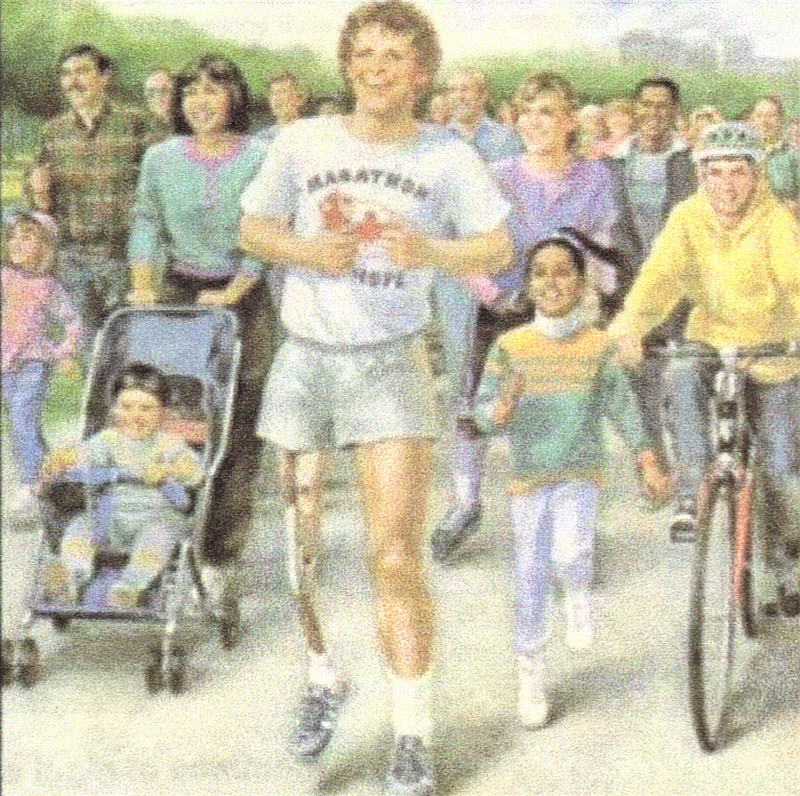 2005, the 25th anniversary of the Terry Fox Marathon, has been triumphant for Terry's legacy. 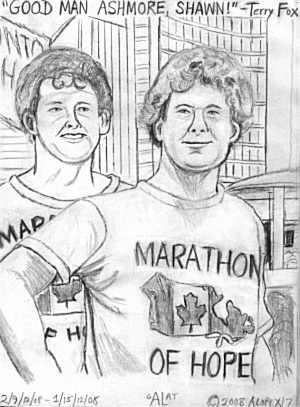 The Canadian mint has placed Terry's marathon on the back of its dollar coin. Terry's story was coming out again -- the first was Home Box's movie in 1983. I wonder what Terry would be like today at middle age. Would he have survived this long? He had an enlarged left ventricle at the time of the marathon, so one could speculate that his heart would have given out had he not died of osteosarcoma in his lungs. However, an enlarged left ventricle is common among athletes. Unfortunately, osteogenic sarcoma is also common among athletic juveniles as well. Kyle Miller, goalie of the 2006 world champions of lacrosse, whose kept his leg, was quite an advocate of the foundation until the cancer returned to his lungs and he passed on Saturday, 8 June 2013. Click here for the link to my review of "Terry" on another of my websites. Runner Manfred Mann, 1984 I have the Mann song on vinyl from June 1984. Also sung in the movie "Terry"
Though you can't see what's in front of you. Playing is Rod Stewart's Tribute, "Never Give Up on a Dream". Claim the road, touch the sun. never, never give up on a dream. that's all you need to be free. right wrist, "GMA", which his grandfather had. Terrance Stanley Fox is dead nearly thirty years, yet his legacy lives on. 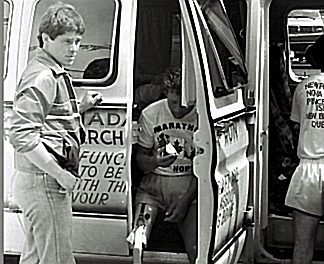 Since his Marathon of Hope across Canada in 1980, the drive to cure cancer has made some progress. 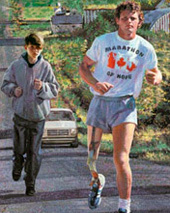 Many years ago, the Terry Fox prosthesis provided the support for a one-legged runner to compete in marathons. The cancer that ultimately took Terry's life, osteogenic sarcoma, a childhood disease of little know origin, has come under scrutiny. Also known as osteosarcoma, it occurs when both regulatory genes, know also as antioncogenes, become inactive, and the cell has nothing to stop it from dividing indefinitely (also know as immortality). 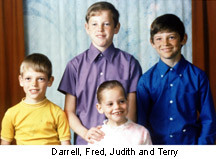 We now think (as Terry did and his father Rolly does) that Terry lacked one of those genes from birth, and when he whacked his knee in an auto accident in November 1976, it knocked out the other gene, just as he'd suspected. I received this information back in 1989, when I audited a course on cancer biology at Penn State. 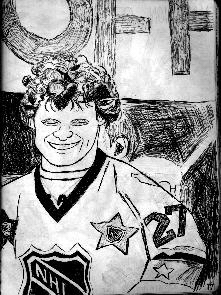 I first heard of Terry Fox from the Daily Collegian at University Park (Penn State). I still have the clipping, and I mentioned it the following night on my radio show at WDFM. Terry shamed me into taking more care of my physical health. While I'd always been a walker, I also became a jogger. It is quite different on the legs! Now that summer is here, I find it difficult to run at 25ºC; I marvel that Terry could run at 38ºC! 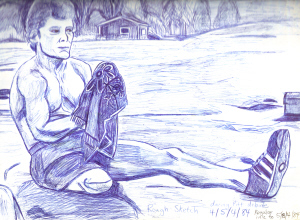 My sketch of a scene from "Terry Fox: His Story" by Leslie Scrivener. Terry received a jersey from Darryl Sittler during his marathon. 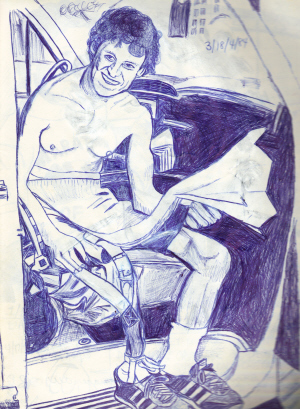 I drew this sketch in 1984. Quotes: "I hope what I've done here has been an inspiration. I hope people will continue where I've left off here." "Somewhere the hurting must stop. (And maybe that place is here.)" The intensity of the central figure is astounding. I've seen of the Marathon of Hope! before colorizing it on a poster. I guessed the towel as red, it was green! Okay, you say, what about Terry Fox ignites your passion? First, my father died of Hodgkins' disease (a form of lymphoma) back in 1964, when it was incurable. Therefore, cancer has profoundly altered my life. Second, I admire Terry's determination, courage, and perseverance, and he'd be slightly younger than I am, so I could have met him in this life. He'd be a friend and a brother to me. I am about the age of his older brother Fred. My admiration for this athlete goes well beyond my own personal experience, which had little athletic inclination in the past. What I see is a purpose to life, something I lack, even three decades after Terry lost his leg and planned the Marathon of Hope. Thirdly, his Marathon of Hope was so profoundly different than the prosaic life I've led as an adult, that the sheer adventure ignites my interest. Hopefully this explains why I admire and love Terry Fox. The book by Douglas Coupland was a vicarious and intimate look into Terry's life. Leslie Scrivener provides the ultimate look at Terry's story. As a historian, I recommend both. I felt as if I'd known Terry to the point of where we'd disagree, which is theology. I do not subscribe to salvation by faith alone. A Canadian Catholic and I both agree that Terry had an express ticket to heaven, not because of faith alone, but because of his faith and good works. 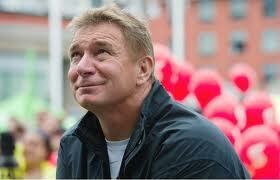 Rick Hansen, who knew Terry and played wheelchair basketball with him, gets honorable mention. He is a living example of what Terry might have been doing now with his foundation had Terry lived. Kudos to Rick, the Man in Motion, and whose foundation is thriving as well to cure spinal injuries. I envy Rick for having known Terry. Rick is six and a half weeks younger than I, while Terry was born a year and seventeen days after me. We'd make quite a trio! One quote which I will note is "Terry Fox died before he had the chance to disappoint us." Well, Rick Hansen did not disappoint us. Steve Fonyo did. 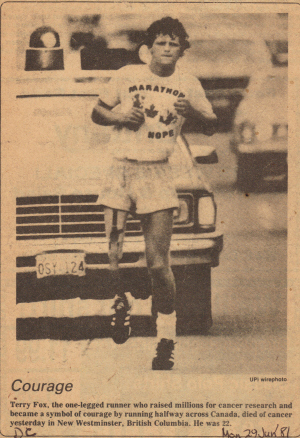 However, it does not take away the fact that Steve Fonyo ran across Canada. Give the man the kudos he deserves. 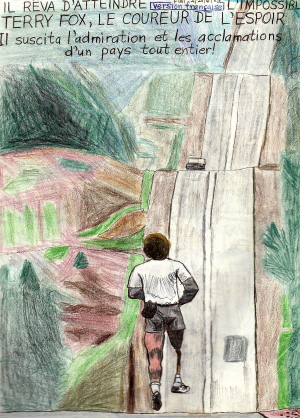 Terry's spirit was probably there at the time, for Steve proved that it is possible to run across Canada on a prosthesis. came out. I saw it in April 1987. I finally gave in and bought the video of the first Terry Fox Story. I don't think it'll ever be on disc. Eric Fryer plays the lead, and he plays it well. It shows a nastier side of Terry, but it shows the brutal reality of his amazing feat. Originally "The Heart of a Champion", Home Box produced it as its first movie back in 1983, when Terry's feat was still fresh in most minds. I've seen it only once before, back in April 1987. Eric Fryer deservedly won an award for the acting, and his gait was much more realistic. The salty language gives it a PG rating, and it makes "Terry" rather whitewashed. Nonetheless, I'd have loved to have been there in 1980. 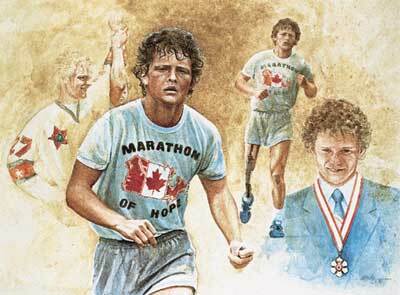 What makes "Terry" better is that the footage of the real Terry Fox is in it. The reason I'd recommend the film -- if one can still get it off Amazon or wherever -- is that is shows a background better of what motivated Terry to run the Marathon of Hope. None of us is a saint, although I wonder whether Terry'd been Catholic would the Pope have already beatified him. Unfortunately, I think this version is also too short. Terry's story cannot be adequatedly told in just over ninety minutes. However, if one sees the two movies, perhaps it will be enough over three hours. Terry remains my hero, because -- as he often said -- he was an average person who proved that any average person can do great things. I expect to find his waiting for me around 2050, and I expect that my spirit and his will hug again. Terry reminds us that life itself is a marathon, and that what we put out comes back with interest. Each of us should hold fast to that proposition. Terry is a hero because his passion for others in the cancer ward -- especially the little kids -- manifested into the run for others. Despite his flaws -- and each of us have them -- he went out and "did something about it." I'd be honored to have one tenth of Terry's passion and courage. Eric Fryer ironically has a wen below his left cheek, near where Terry's wen was. He has some freckles, especially on his shoulders, but I'd have to concede that Shawn Ashmore has the better lentingenous body to play Terry Fox. The Foxes did not approve of this view of Terry, but I suspect it was just a little closer to reality. In two of the best examples of Terry's speeches, he utters salty language. After meeting Greg Scott, he utters s*** twice because he's crying. Terry, CRY! Let it out! There's nothing unmanly about showing emotions. At the end of the road, he says sincerely, "All I can say is, ah, f***, if there's any way I can get out there again, I will..."
I'd like to hang around with this guy! He's real! Errors in the movie: the doctor told Eric as Terry that he had a 50-70% chance of survival. In reality, it was 20-30% as Betty later mentions on the CBC's The Fox Family Wish in 1999. In "Terry" Shawn repeats: "They said my chances were less than 50/50, but I beat it." Robert DuVall in the end as Bill Vigars doubts that Terry knew he was dying. Interviews from November and December 1980 contradict it. Terry was so hung up on salvation by faith alone, that he ignored all the good works he wrought. Betty also mentions it in the Terry Fox ESPN video. Fox Story", which I find closer to reality. Ray Bedard is leaning on the door. He interpreted French in Québec for the Marathon of Hope. Many thanks to Ray Bedard, who contacted me in mid-May 2010 about this picture. It was ironic, for I was working on my "Alternate 1980" site, when in a fantasy I meet Terry Fox in Québec, and serve as his interpreter. Then I found out that someone actually was the French interpreter of the Marathon of Hope. None of the books ever mentions him, so I am hono(u)red to give him just recognition here. Ray modestly emailed me to note that many others worked behind the scene. I agree, and I also agree that had I been one of them, it'd have made my summer! Terry started something MUCH bigger than he, and it has endured a generation. Therein lies a sign of greatness.